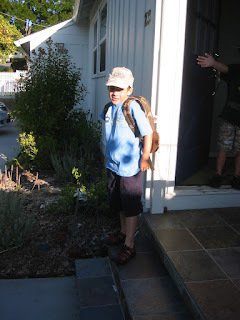 Today was the first day of term and Adam has started in first grade. This means a full day of class, and a promotion to the 'big playground'. The last few weeks have been a rush of activity. 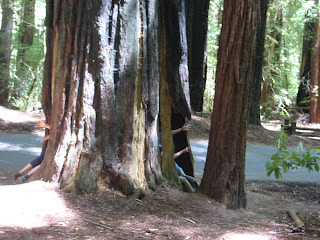 We went back to the redwoods, this time to Big Basin State Park to stay in the tent cabins. 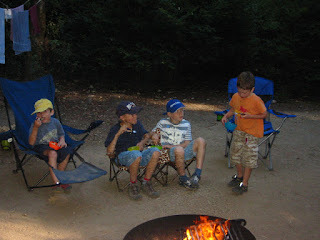 We cooked on the fire and ate smores...of course. 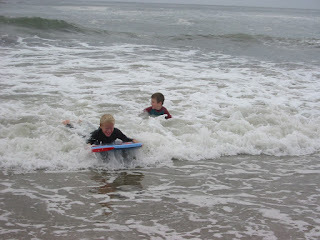 Adam also did some body surfing with Elliot while Thomas used the board. We managed to squeeze in another bike ride, this time to Campbell. 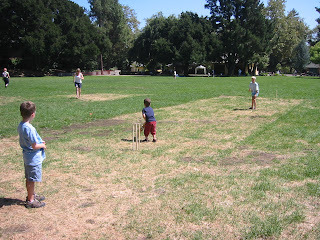 We stopped at Oak Meadow Park on the way home for a cricket match. After some coaching of course. 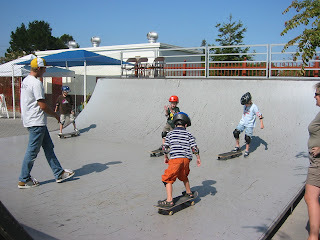 We wrapped up the weekend with a private skateboard lesson at the Campbell Skate Park. 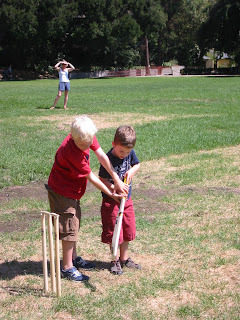 The boys had a blast, they all made an improvement over the hour lesson and they we unanimous in thinking Brad, the teacher, was cool. 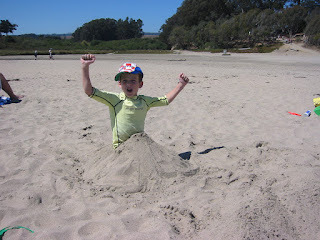 Finlay was particularly pleased at being called "Fin Man"! 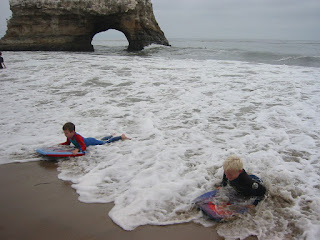 ...and a day at Natural Bridges State Beach in Santa Cruz. 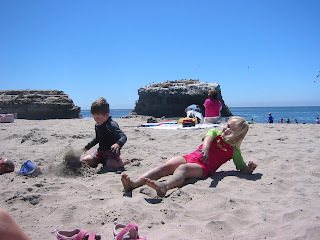 It was warm and sunny with no trace of the marine layer which often plagues the beaches in the summer. We had a picnic and the children attempted to achieve fame by building the largest sand castle in the world... Adam, however got sidetracked. 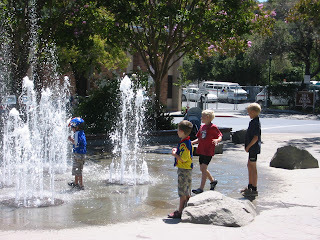 The fountain in the plaza (following bike ride and smoothies). 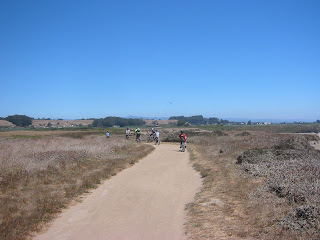 The ride out to Landing Cove beach at Wilder Ranch. Picnic at Landing Cove beach. The San Jose Giants at home to the Bakersfield Blaze. Go Giants! (Unlike last time they actually won the game). 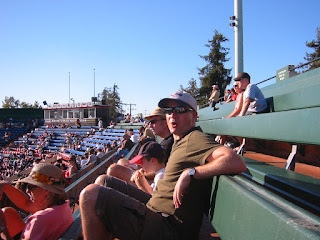 Baseball accompanied by the traditional beer, hot dogs and malted. Well, anything is better in camo isn't it? 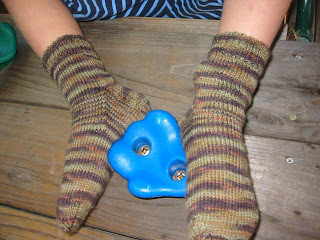 I knitted these socks for Finlay in Lornas Laces in the camo colourway. The pattern is more of a stripe than really camo, but the colours are good and F seems pleased with them. As usual a generic top-down pattern knitted over 52 stitches on 2mm needles. 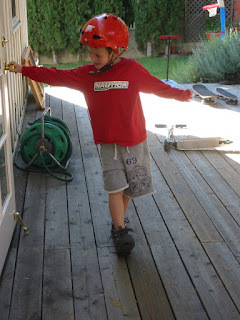 Adam completed his "homework challenge" this week, and earned enough points to get his much-anticipated Heelys. He is sleeping with them by his bed and practising like mad. 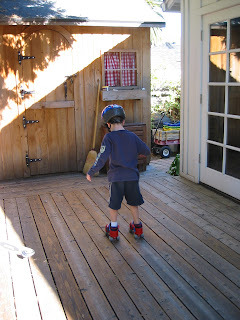 Finlay earned enough points to get a street hockey set, so they have both been practising thier roller-skate technique. 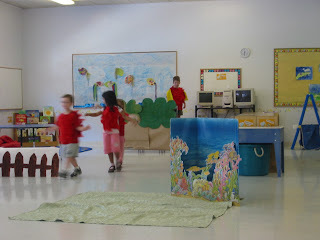 We just came back from Finlay's preschool play. He had told us that he was playing the part of "the main bird" but what we had failed to appreciate was that this was the lead role in "Papeto the scared bird". 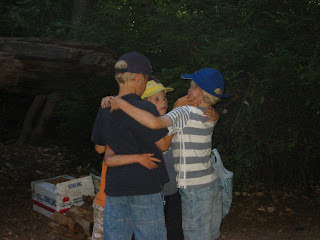 Papeto is too scared to fly when his siblings leave the nest, so he follows them to thier tree, by land, with the assistance of several other animals: a fox; a fish; a frog; and a gopher. 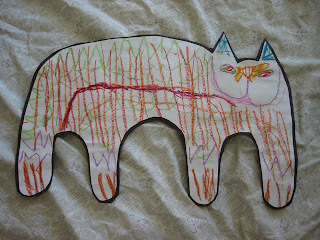 The other animals had a single speaking line, but Finlay had memorized all his lines and stage positions which formed the main part of the narrative. 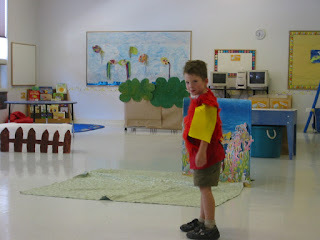 We were really surprised and impressed that he had the confidence to stand up in front of all the parents in the class, and the children from the other classes. He spoke really clearly - which was great to hear! 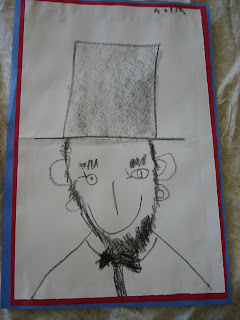 I think his speech therapist would be delighted with his progress. 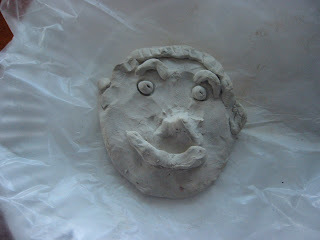 I recently photographed some of the huge pile of the boys artwork. A lot of the stuff goes on the walls for a while, but I wanted to preserve some of it for longer. 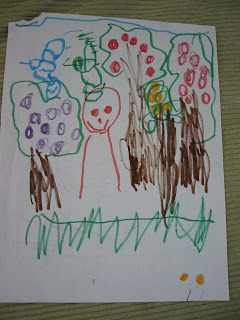 Finlay's picture above is of someone in an orchard. 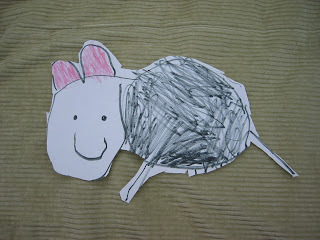 This is Finlay's picture of a rat above, Adam's cat below. 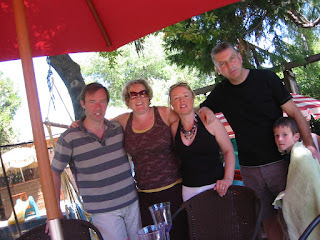 We had visitors from England on Saturday. 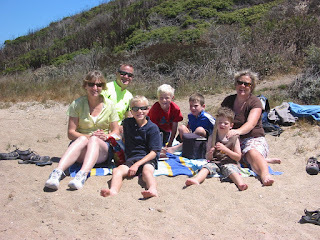 My friend Alison, who I lived with in Brighton with, was vacationing in California with her family. I got to meet her children, who were delightful. 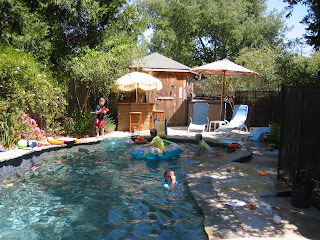 Our pool was like a child soup all afternoon. What was particularly nice was that, although I haven't seen Alison for 10 years, we picked up our conversation more or less where we left off!